颜文超, 宋伟华, 俞存根, 周青松, 郑基, 刘惠, 邓小艳, 张平. 瓯江口春秋季虾蟹类群落结构[J]. 上海海洋大学学报, 2019, 28(1): 134-144. YAN Wenchao, SONG Weihua, YU Cungen, ZHOU Qingsong, ZHENG Ji, LIU Hui, DENG Xiaoyan, ZHANG Ping. 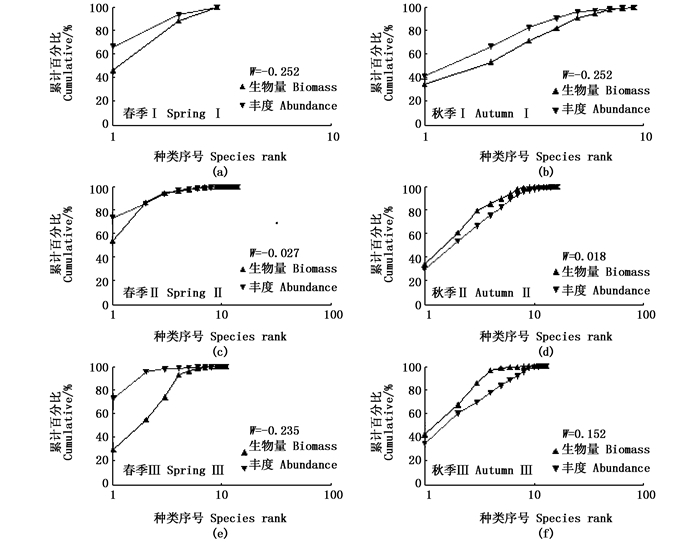 Community structure of shrimps and crabs in spring and autumn in Oujiang River Estuary[J]. Journal of Shanghai Ocean University, 2019, 28(1): 134-144. 刘瑞玉. 黄海及东海经济虾类区系的特点[J]. 海洋与湖沼, 1959, 2(1): 35-42. LIU R Y. Notes of the economic macrurous crustacean fauna of the Yellow Sea and the East China Sea[J]. Oceanologia et Limnologia Sinica, 1959, 2(1): 35-42. 沈嘉瑞, 刘瑞玉. 中国海蟹类区系特点的初步研究[J]. 海洋与湖沼, 1963, 5(2): 139-153. SHEN J R, LIU R Y. Preliminary studies on the characteristics of the crab fauna of China Seas[J]. Oceanologia et Limnologia Sinica, 1963, 5(2): 139-153. 刘瑞玉, 徐鳳山. 黃、东海底栖动物区系的特点[J]. 海洋与湖沼, 1963, 5(4): 206-321. LIU R Y, XU F S. Preliminary studies on the benthic fauna of the Yellow Sea and East China Sea[J]. Oceanologia et Limnologia Sinica, 1963, 5(4): 206-321. 戴爱云, 杨思琼, 宋玉枝, 等. 中国海洋蟹类[M]. 北京: 海洋出版社, 1986: 1-641. DAI A Y, YANG S Q, SONG Y Z, et al. Chinese marine crab[M]. Beijing: Maritime Press, 1986: 1-641. 魏崇德. 浙江动物志-甲壳类[M]. 杭州: 浙江科学技术出版社, 1991: 1-481. WEI C D. Animal zoology of Zhejiang province-crustacean[M]. Hangzhou: Zhejiang Science and Technology Press, 1991: 1-481. 刘文亮, 何文珊. 长江河口大型底栖无脊椎动物[M]. 上海: 上海科学技术出版社, 2007: 1-203. LIU W L, HE W S. Benthic macro-invertebrates in the Yangtze estuary[M]. Shanghai: Shanghai Science and Technology Press, 2007: 1-203. 俞存根, 宋海棠, 姚光展. 东海大陆架海域蟹类资源量的评估[J]. 水产学报, 2004, 28(1): 41-46. YU C G, SONG H T, YAO G Z. Assessment of the crab stock biomass in the continental shelf waters of the East China Sea[J]. Journal of Fisheries of China, 2004, 28(1): 41-46. 朱成德. 虾蟹类的幼体发育[J]. 水产养殖, 1989(3): 26-27. ZHU C D. Larval development of shrimps and crabs[J]. Journal of Aquaculture, 1989(3): 26-27. 俞存根, 宋海棠, 姚光展. 东海细点圆趾蟹的生物学特性[J]. 水产学报, 2004, 28(6): 657-662. YU C G, SONG H T, YAO G Z. Biological characteristics of Ovalipes punctatus in the East China Sea[J]. Journal of Fisheries of China, 2004, 28(6): 657-662. 俞存根, 宋海棠, 姚光展. 东海蟹类群落结构特征的研究[J]. 海洋与湖沼, 2005, 36(3): 213-220. 郑献之, 俞存根, 陈小庆, 等. 舟山渔场及邻近海域蟹类种类组成和时空分布[J]. 海洋与湖沼, 2012, 43(1): 147-153. ZHENG X Z, YU C G, CHEN X Q, et al. Species composition and spatio-temporal distribution of crabs in Zhoushan fishing ground and its adjacent areas[J]. Oceanologia et Limnologia Sinica, 2012, 43(1): 147-153. 徐开达, 卢占晖, 薛利建, 等. 中街山列岛保护区蟹类群落结构特征的研究[J]. 上海海洋大学学报, 2012, 21(6): 1032-1037. XU K D, LU Z H, XUE L J, et al. Crab community structure in the protected Zhongjieshan Islands area[J]. Journal of Shanghai Ocean University, 2012, 21(6): 1032-1037. 夏陆军, 俞存根, 蔡厚才, 等. 南麂列岛海洋自然保护区虾类群落结构及其多样性[J]. 海洋学报, 2016, 38(2): 73-83. 吕振波. 山东近海经济生物资源调查与评价[M]. 北京: 海洋出版社, 2010. LV Z B. Investigation and evaluation of economic resources in Shandong offshore[M]. Beijing: China Ocean Press, 2010. 周红, 张志南. 大型多元统计软件PRIMER的方法原理及其在底栖群落生态学中的应用[J]. 青岛海洋大学学报, 2003, 33(1): 58-64. CLARKE K R. Non-parametric multivariate analyses of changes in community structure[J]. Austral Ecology, 1993, 18(1): 117-143. 张焕君, 李凡, 丛日翔, 等. 黄河口海域无脊椎动物群落结构及其变化[J]. 中国水产科学, 2014, 21(4): 800-809. ZHANG H J, LI F, CONG R X, et al. Community structure of invertebrate and its change in Huanghe (Yellow River) Estuary[J]. Journal of Fishery Sciences of China, 2014, 21(4): 800-809. 刘瑞玉. 中国海洋生物名录[M]. 北京: 科学出版社, 2008: 1-1267. LIU R Y. Checklist of marine biota of China seas[M]. Beijing: Science Press, 2008: 1-1267. 胡成业, 徐衡, 水柏年, 等. 温州瓯飞滩邻近海域春季游泳动物群落结构及多样性[J]. 南方水产科学, 2015, 11(3): 7-15. 姚炎明, 陈吉余, 陈永平, 等. 温州湾水流及其与地形的关系[J]. 华东师范大学学报(自然科学版), 1998(2): 61-68. YAO Y M, CHEN J Y, CHEN Y P, et al. The relationship between current and topography in Wenzhou Bay[J]. Journal of East China Normal University (Natural Science), 1998(2): 61-68. 徐兆礼. 瓯江口海域夏秋季蟹类数量分布与环境的关系[J]. 水产学报, 2009, 33(2): 237-244. XU Z L. Relationship of crab density distribution with environment in the Oujiang Estuary during Summer and Autumn[J]. Journal of Fisheries of China, 2009, 33(2): 237-244. 戴爱云, 冯钟琪, 宋玉枝, 等. 三疣梭子蟹渔业生物学的初步调查[J]. 动物学杂志, 1977, 12(2): 30-33. DAI A Y, FENG Z Q, SONG Y Z, et al. Preliminary survey of fishery biology in Portunus trituberculatus[J]. Chinese Journal of Zoology, 1977, 12(2): 30-33. 吕振波, 李凡, 王波, 等. 黄海山东海域春、秋季鱼类群落结构[J]. 水产学报, 2011, 35(5): 692-699. LÜ Z B, LI F, WANG B, et al. Community structure of fish resources in spring and autumn in the Yellow Sea off Shandong[J]. Journal of Fisheries of China, 2011, 35(5): 692-699. 宋海棠, 俞存根, 薛利建, 等. 东海经济虾蟹类[M]. 北京: 海洋出版社, 2006: 5-14. SONG H T, YU C G, XUE L J, et al. Donghai economic shrimp and crab[M]. Beijing: China Ocean Press, 2006: 5-14. 金显仕, 单秀娟, 郭学武, 等. 长江口及其邻近海域渔业生物的群落结构特征[J]. 生态学报, 2009, 29(9): 4761-4772. 祝永康. 瓯江溺谷海湾充填成陆和河口湾的形成过程[J]. 地理学报, 1993, 48(3): 254-261. 刘维达, 林昭进, 江艳娥, 等. 南海北部陆架区底层渔业资源的空间分布特征[J]. 热带海洋学报, 2011, 30(5): 95-103. 李凡, 张焕君, 吕振波, 等. 莱州湾游泳动物群落种类组成及多样性[J]. 生物多样性, 2013, 21(5): 537-546. LI F, ZHANG H J, LÜ Z B, et al. 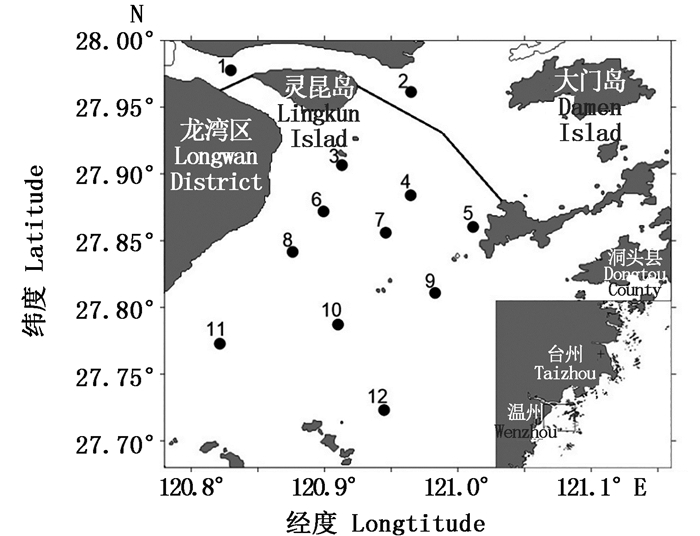 Species composition and community diversity of nekton in Laizhou Bay, China[J]. Biodiversity Science, 2013, 21(5): 537-546. Abstract: In May 2013 (spring) and October 2013 (autumn), fishery resources were surveyed using a stern-trawling shrimp net in the Oujiang Estuary area of Wenzhou. A total of 12 stations were established. The survey data were standardized according to the swept area and escape coefficient at each station. Using the methods of relative importance index(IRI), hierarchical clustering(CLUSTER), non-metric multidimensional scaling(NMDS), ABC curve, etc., the community structure, spatial distribution and stability of shrimps and crabs in the waters of Oujiang Estuary were analyzed. The aim is to study the differences in the community structure of the spring and autumn of the Oujiang Estuary. The results showed that:The two surveys identified 25 species of shrimps and crabs, belonging to 11 families and 16 genera, 18 species in spring and 23 species in autumn; The number of species in the estuary area was lower in spring and autumn, and the nearshore and island reef areas were higher; There are three dominant species of Parapenaeopsis hardwickii, Acete schinensis, and Portunus trituberculatus in spring, and five dominant species of Exopalaemon carinicauda, Solenocera crassicornis, Portunus trituberculatus, Charybdis japonica and Scylla serrata in autumn. The ecological types show that shrimps and crabs are dominated by wide temperature, low salinity and wide temperature and wide salt species, and no cold water species were found. 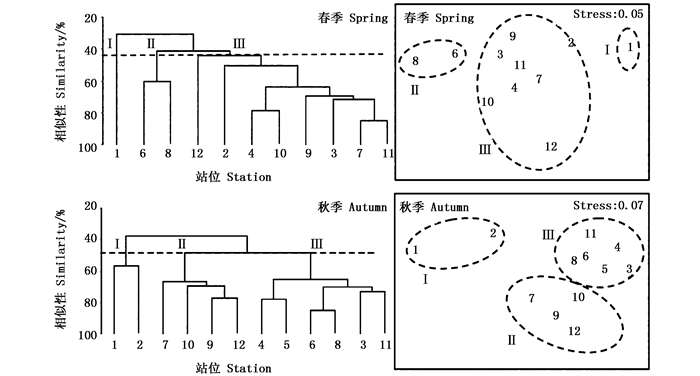 Cluster analysis divided the stations in spring and autumn into three communities. Non-metric multidimensional scaling (NMDS) shows that the clustering results in the spring and autumn are credible (0.05 ≤ Stress < 0.1).The analysis of similarity (ANOSIM) showed that the differences between the communities in spring and autumn were significant and the significance levels were less than 0.05, and the results were acceptable. The analysis of SIMPER shows that the differences between the communities in spring and autumn are mainly determined by the difference of dominant species. The results of ABC curve analysis were in accordance with the actual conditions in spring and autumn. In spring, W < 0, the community composition was dominated by small, low-quality species; In the autumn, W>0, the community composition was dominated by adults.